DIDO-Class cruiser ordered from Cammell Laird of Birkenhead with the 1939 War Emergency Programme and launched on 6th September 1941. 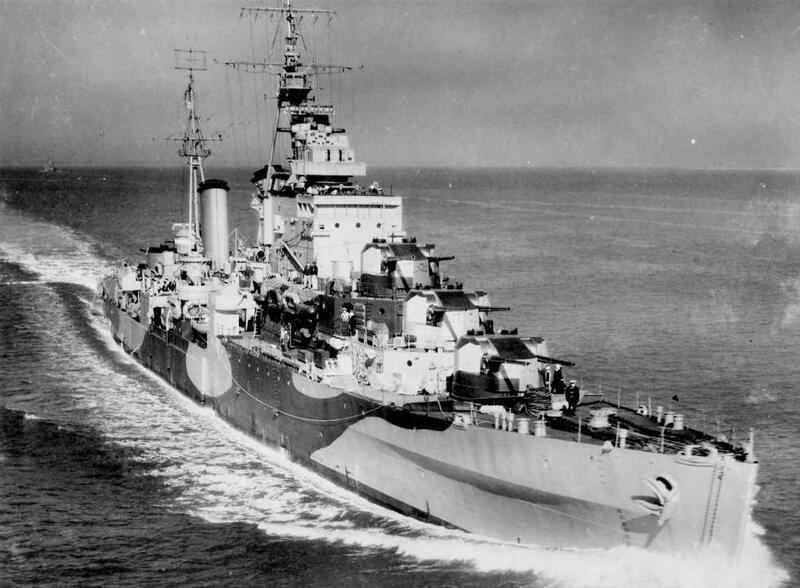 She was the 3rd RN warship to carry the name dating from 1782, when used for a Prize (JASON). The ship completed in August 1942 and had the After funnel shortened to reduce top-weight. The original 5 turret design was retained. Following the loss of HMS COVENTRY which had been adopted by the city of Coventry in March 1941 she became the replacement ship and a liaison was maintained with the civil community during WW2. 14th Commissioned for service after delay due to shortage of materials. Nominated for duty in Mediterranean. August Shakedown and work-up at Scapa Flow with Home Fleet. September On completion retained in Home waters with 10th Cruiser Squadron. aircraft sent to Russia with Convoy PQ18. Called at Spitzbergen on passage. TO RUSSIA by RA Ruegg and RUSSIAN CONVOYS by B Schoefield). destroyer screen for passage to Gibraltar in support of North African landings. MORE CLOSELY by Corelli Bamett). 6th Joined Force H on arrival. to divert enemy attention to landings. SIRIUS based at Bone for offensive operations against enemy convoys in Gulf of Tunis. HM Destroyers QUENTIN and QUIBERON provided screen. (For details see THE BATTLE FOR THE MEDITERRANEAN by D MacIntyre). 4th Taken in hand for temporary repair by HM Dockyard. February Temporary repair in continuation. to Permanent repair arranged in USA. 5th Passage to USA with call at Bermuda. 30th Taken in hand for repair in Philadelphia. November Repair and refit work completed. fitted. Fire-control radar provided for forward close range AA armament. IFF (Interrogation) equipment and VHF D/F set installed. April Joined 10th Cruiser Squadron, Home Fleet on completion. Carried out naval gunfire support training. Joined HM Cruisers ORION, AJAX and EMERALD at Belfast to form Force K.
Assigned gun batteries at Vaux-sur-Aure in Bombardment Plan. 5th Netherlands Gunboat FLORES joined Force K in Solent. Passage with Convoy G12 through swept Channel to Bombardment area. previously silenced by HMS AJAX. 7th Deployed in Eastern Task Force area during Build-up Phase for gunfire support. TUSCALOOSA and USS QUINCY screened by USN Destroyers. HM Cruisers BELFAST and DIADEM during British offensive in Caen area. Hit on the quarterdeck by 150mn shell from shore battery which failed to explode. July Naval gunfire support off Normandy in continuation. Returned to Devonport for re-lining of main armament barrels. Resumed support role off Normandy. and LANDINGS IN NORMANDY, JUNE 1944 (HMSO)). Nominated for support of landings in south of France. landings in southern France as part of Task Force 87 under US Command. MARBLEHEAD and BROOKLYN screened by US destroyers. 14th Met CAMEL Convoy SF1A. 15th Fired 394 rounds at batteries between Cannes and Antibes and on St Marguerite. Later bombarded shore targets in Golfe de Frejus. Under some return fire. 16th Bombarded troops and vehicles in CAMEL area. 22nd Released from DRAGOON and resumed control by CinC Mediterranean. September Nominated for duty in Eastern Mediterranean with British Aegean Force. October Aegean support in continuation. 16th Deployed on interception of craft evacuation German troops and sank 2 caiques. November Support duty in Aegean in continuation. 9th Escorted military convoy to Salonika for re-occupation. 22nd Allocated to British Pacific Fleet on formation. 25th Took passage from Alexandria for Trincomalee. December Joined BPF on arrival. 13th Part of Force 67 covering air attacks on harbour, rail and oil installation in N.
KEMPENFELT, WESSEX, WHIRLWIND, WRANGLER and WAKEFUL. (For details of operations in Indian Ocean see OPERATION PACIFIC by E Gray). 4th Present during air operations. 13th Took part in rehearsal at sea for MERIDIAN operations (See below). during air attacks on oil refinery at Pladjoe, north of Palembang. same ships of TF63 (Operation MERIDIAN). February Passage to Sydney with call at Melbourne on 4th February. 10th Arrived at Sydney with Task Force 113 (redesignated TF63 after MERIDIAN). March Exercised with BPF units for operational service in Pacific with 5th US Fleet. 7th Arrived at Manus, Admiralty Islands as Task Force 113. 15th After delays US approval received for deployment with US 5th Fleet. 18th Took passage from Manus for joint RN/USN operations in SW Pacific. 23rd Sailed from Ulithi to support US landings on Okinawa. Ludley and WAR WITH JAPAN (HMSO). 26th Part of TF57 deployed on neutralisation of airfield in Sakishima Group. Acted as radar picket with HM Destroyer KEMPENFELT 30 miles away from Fleet units. 28th Deployed as radar picket to refuelling group with HM Destroyer WAGER. Under air attacks. attacks by RN and USN carriers of Task Forces 57 and 58 (Operation ICEBERG). 9th Diverted from ICEBERG with British Task Force 57 for air attacks en Formosa. 15th Returned to Sakashima Gunto with TF57 to continue ICEBERG operations. May Sakishima Gunta operations in continuation. 4th Sailed to Sydney with HMS ILLUSTRIOUS, HMS WAGER and HMS WHELP. UGANDA in Task Force 37 (Redesignation of TF57 after transfer to US 3rd Fleet). shore targets and shipping in Japan. 3rd Deployed with Task Force 37 and covered carriers during flying operations. 10th Detached from covering duty. shortage of fuel from British support tankers. HM Destroyers TYRIAN, TUMULT, TUSCAN and QUIBERON (RAN). 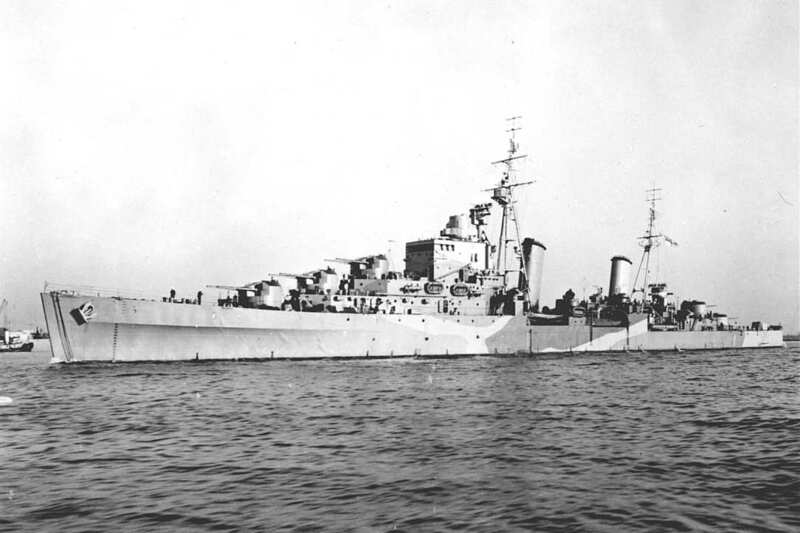 HMS ARGONAUT went to Formosa and then after being joined by HM Cruiser BELFAST to Shanghai to assist US Navy ships in repatriation of allied nationals. The ship remained with the British Pacific Fleet and was based at Hong Kong for the rest of 1945. She returned to Portsmouth in 1946 and was reduced to Reserve status. This cruiser was not recommissioned and laid-up in Reserve until being placed on the Disposal List in 1955. Sold to BISCO for demolition by J Cashmore and arrived at the breaker’s yard in Newport in November 1955.